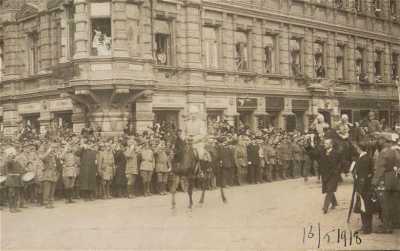 To celebrate the end of the War of Independence, a big victory parade was organized in Helsinki on the 16th of May, 1918. 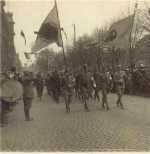 The main political objective of the parade was to counterbalance the German influence in the country. When the German troops had, in early April, taken Helsinki, the whites in southern Finland had manifested their gratitude abundantly. 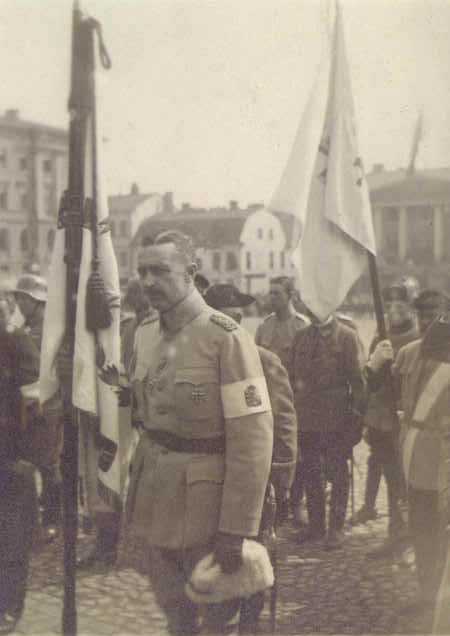 Mannerheim wanted to demonstrate a Finnish army to the residents of Helsinki, and to remind them that it was their own army that had decided the outcome of the war. The parade comprised a march into the city, an inspection and a march-past. 12,000 men participated, accompanied by five separate brass bands as well as smaller troop bands. The march of the white army began from the quarter of Töölö, along the street, presently called Mannerheimintie, and from the neighbourhood of the Stadium, the Eläintarha sports field and the former Pasila railway station.The Commander-in-Chief and his staff officers were riding in front; the other troops were grouped into infantry units led by Commander Wetzer of the Western Army, by the staffs of the Karelian Army Corps, of Colonel Hjalmarson and of Major General Linder of the Savo Group. These were followed by artillery, dragoons (the Uusimaa Dragoon Regiment) and cavalry Jägers. 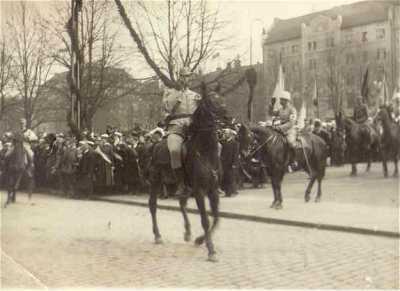 The troops who had participated in the occupation of Tampere, bore as a symbol a fir twig on the left side of their headpiece. Efforts had been made to dress the yeoman army uniformly for the parade, at least by regiments, but there was still a lot of variation in the clothing. 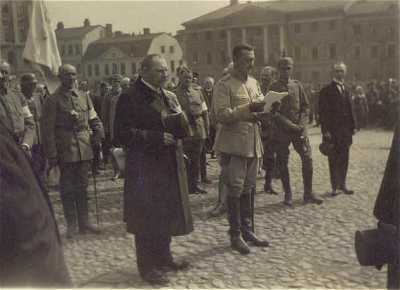 Theslöf, the military governor of Helsinki, and Mayor J. von Haartman received the Commander-in-Chief at the end of Läntinen Heikinkatu (later Mannerheimintie), near the site where Mannerheims statue is located at present. The parade continued along Läntinen Heikinkatu, Pohjoisesplanadi and Unionkatu to the Senate Square. Only the first sections of the troops marched as far as the square, the other sections continuing their march to the Market Square, Katajanokka and Kruununhaka to wait. Red and yellow flags with lions and flags with diagonal blue and white stripes were flying along and above the streets. The latter-style flags had been composed by taking away the red colour from the Russian tricolor (the Finnish flag). 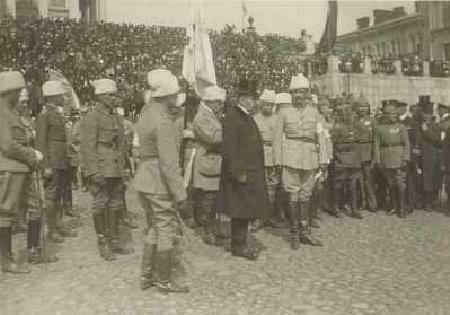 In connection with the inspection of the troops by the speaker of the Senate and the Commander-in -Chief, the commander made the announcement that the troops present had been given the honorary titles of the White Guard of Finland, the Jäger Regiment of the Guard and the Karelian Regiment of the Guard. The Guards of Lapua, Vöyri and Vaasa were to be integrared into the White Guard. The Parade Day, the 16th of May, was celebrated as the Flag Day of the Army until the year 1942, and a parade was organized on that day until the year 1939.